1. Wash rice&drain. Add water boil the Rice. Each grain of the cooked Rice should be separate. 2.Heat the Ghee and fry ths cashewnuts,Raisins separately, Remove &keep aside. 3. Fry the onions in the ghee till golden in colour and keep aside. 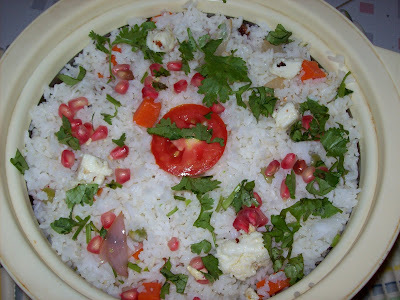 4.Add the rice, Paneer, Greenpeas,carrots, Fruit pieces, paste& salt and mix well. 5.Warm the saffron a little, rub in a little warm waterand add to the Rice. 6. Decorate with the fried cashewnuts, Raisins, onions&corriender. Serve hot with spicy green fresh curds mixed with green chutney. The anaar dana completes the rice well... Looks delicious and colorful.